Every business struggles to persuade people to open emails. It might seem frustrating; If those subscribers would only read your emails, they would find all manner of goodies for their delight and delectation. You have tried responsive email templates that adjust the size of your message according to the screen size used and there was still no increase in engagement. 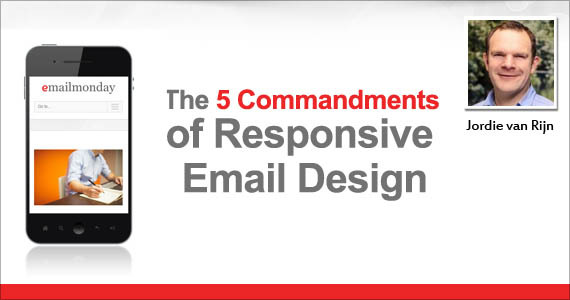 The 5 Commandments of Responsive Design will compel your prospects to read and take action. They will make your emails attractive, easy to read and compelling. If you have a well-thought out subject line and pre-header your emails stand a better chance of being opened, but they need to work well or people will just hit DELETE even if you have a $2,000 an hour copywriter. Traditionally people have started big and then reluctantly cut things down to accommodate the needs of mobile users. This encourages an approach where emails are unnecessarily crowded. But you start with a minimalist mobile design it makes you think hard before you add anything in to take advantage of the larger screens on tablets, laptop and desktop computers. The result is that every email you send is decluttered by nature and looks good whatever screen people are using. Click through rates improve because your link stands out more clearly. GetResponse research on the importance of responsive email design shows that 82% of people open emails on their phones and that over half of that group delete emails that are not formatted for mobile displays. The trend towards mobile email can no longer be ignored. Responsive emails are no longer just an option. Standard 12 point fonts work well on 17” screens, but on 5” screens scale down to 6 point or below. Even given the wonderful clarity of a phone screen retina displays, emails are tough to read without zooming in. Avoid the issue by using at least 18 point fonts in the mobile version of your emails. Tablet versions can use 14 point fonts and just keep the 12 point font for the desktop version. Think about your users and where they use phones. Very often they are opening emails in less than ideal lighting conditions. Make sure that you use colors that contrast well with the email background color. Users may disable images in email in order to save bandwidth. Your email must make sense even if images do not display. It is best to get your message across in the first screen that a user sees. This includes your call to action button, which should be a large one on your mobile email designs – Think finger-sized. Your writing must be short, snappy and focused. Your emails will always be written this way, but for mobile users they need to be even more so. 77% of emails opened on mobiles are never opened again – You MUST get it right first time, because there is no second chance. “Click here” is not going to cut it as a call to action in an email read on a phone. You need very strong wording and images to compel your readers to do it NOW! Your Call to Action button needs to be the focus of your email. It needs to stand out in terms of size, contrast and wording. Test everything. If you test 100 factors and each gives you a 1% increase in click through rate then your overall click through rate nearly triples, going up by a massive 2.7 times. If you test 50 factors and each gives you a 5% click through increase then your overall click through rate will be 11.47 times higher! Excuse the mathematician’s magic – but it is to illustrate a point. Not testing is just a missed opportunity. Test mobile designs separately from desktop designs for the best results. Natural selection is at work in every niche. Make sure that your company is the one that is most successful and grows more than competing companies. There is no good excuse to not evolve your email program to incorporate mobile, for if the knowledge is not in-house there is such a thing as the email marketing agency to aid. 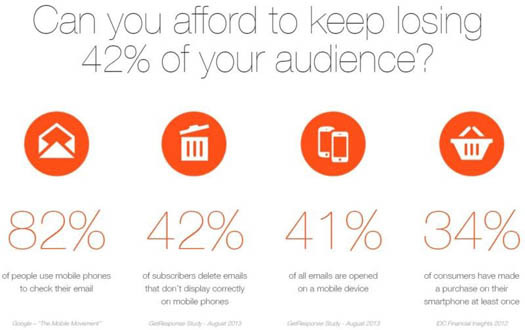 Mobile email is a fact of life, yet vast numbers of marketers still have no strategy to target mobile users. These companies are going the way of the mastodon – extinction. We all learn from each other. Please use the comments box below to share your own story of responsive email design making a difference to your profits. Profile: Jordie is an independent email marketing consultant with his company eMailMonday. He specializes in email marketing and event-driven campaigns, helping brands to get the most from their email marketing efforts. Selecting emailtools at email vendor selection website is another. Great tips! I am looking for email marketing software with responsive templates to ready to use. Could you recommend something for begginer? Thanks for your tips. Brilliant.. should be common sense but isn’t. 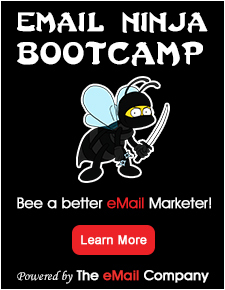 I”d love to see samples of creative/email ads that work for you. Also I’d like to hear your thoughts on purchased lists. So many marketers are against them and yet as a marketer we have no choice. Unfortunately deployment centers web based or online hosted software providers for email marketing don’t allow purchased lists Business to Consumer anyway. Here’s my biggest issue. It doesn’t matter what the email campaign is I cannot get anyone to fill out a form. Doesn’t matter if its an auto dealer list offering access to free Mergers and Acquisition Reports, or giving away a free flash drive. I can get excellent open rates.. even excellent click through rates.. but NO ONE orders.. and the ones that have a short name, email, optional phone form.. (3 fields) still nothing.. Those are just to access something or get a free demo, or register for something… or…. noone fills out the form. I’m perplexed. (I stand correctedl… I have had several consumers fill out forms for a house I am advertising for someone to sell. Recently I sent out an email marketing campaign actually advertising email marketing.. 1788 Click throughs.. They even click the “Order” button, but then nothing. No order came through.